SDR#'s SpyServer streaming server now supports the direct sampling mode on RTL-SDR dongles and it's probably the cheapest way to set up a HF streaming server. 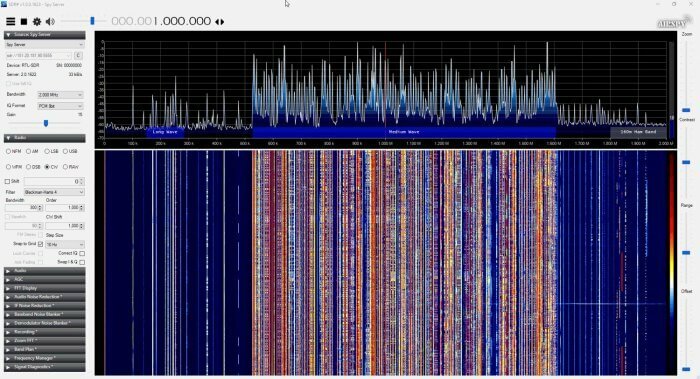 SpyServer is a streaming server for SDR# and Airspy products. Although it's designed for Airspy products it also works well with RTL-SDR dongles. On RTL-SDR dongles the direct sampling mode allows you to receive HF frequencies by bypassing the tuner. The dynamic range is not quite as good as using an upconverter and there are Nyquist images from sampling at 28.8 MHz centered around 14.4 MHz, but in most cases it is good enough to give people decent HF results especially if filtering is used. Normally a hardware hack is required to enable direct sampling, but our RTL-SDR Blog V3 units have direct sampling built in and ready to go just by connecting an HF antenna to the SMA port, and enabling the Q-branch direct sampling mode. There is a sample server set up at sdr://151.20.181.90:5555. Direct Sampling for #RTLSDR was added to Spy Server. This must be the most affordable networked HF radio ever. Thanks for your feedback, I managed to go to I or Q branch via spyserver.config file and the I noticed the frequency spectrum is limited now to 0 – 14.4Mhz so I am still missing the spectrum between 14.4Mhz – 24 Mhz. Furthermore how can I stop & start spyserver (after reading the spyserver.config file again) on the cmd line via ssh? What are the exact cmd’s? Hi Peter, I’m not using spyserver anymore. I’ve switch back to rtl_tcp. I did notice in my archived mem cards that I used the upconverter. I’ll try to experiment this weekend. To stop the spyserver via cmd line ssh..
new terminal comes up …green baseline. you can now log off the ssh and spyserver will keep running. Thanks for your reply regarding stopping & starting spyserver. Let me know what your experience is with rtl_tcl. If it is possible to select the sampling method from SDR# that would be preferable! In the spyserver.config file, a little up from the bottom, there is a RTL Sampling mode header. Select Q branch there. I have installed my rtl-sdr USB stick on a RP 3 MODEL b+ and setup a running spyserver on the RP so I can monitor via SDR# on my windows PC the data IO stream which is successfull but stops at frequencies < 24Mhz. Looking to the snapshots added to the above article I cannot select the Q branch related to direct sampling so I questioned myself how can I control the direct sampling mode of my remote rtl-sdr stick via SDR#? Sofar I cannot control the demodulator type of the stick except when I plug it in directly on my windows PC and set the source to "RTL-SDR (USB)". However I want to use the rtl-sdr stick remotely.